Traveler, FireWire audio interface from MOTU in the Traveler series. Product replaced by the MOTU Traveler-mk3. While using the Motu Traveler I was able to get really good results when using it with my Power-book, I first started using the Traveler back in June of 2008 to be exact and used it all the way up till about the summer of 2010. The pre-amps are pretty solid and of good quality, you wont have any issues with them at all even if you push them to the limits they will still stay pretty quiet for you. The Motu Traveler can work as a standalone format converter as well. All of the features that I desired at the time seemed to be all part of the specs of the Motu Traveler and that was a big part of my decision to purchase the Traveler. I didn’t receive any updates for it during the 2 years that I was using it though. I am not sure why, because I have heard other people online talking about the updates. The size of the Traveler is compact enough that it can fit in your laptop bag or any standard size carrying bag. It is not a very big or bulky unit. It is powered by your computer when you plug it up, or you can power it with a battery which I don’t recommend. 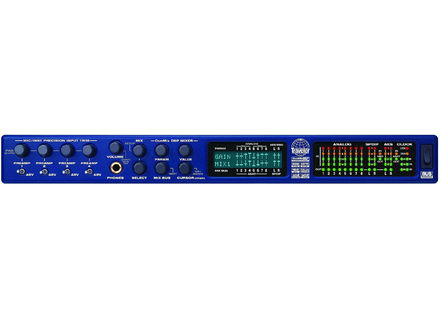 You can record up to 192kHz and it has built in phantom power. I have used the Motu Traveler to record a lot of different instruments and vocals as well as using it to record a lot of sound effects that we generated out and about, which is one of the reasons that it came in handy being so portable like it is. We could just whip it out anywhere and record several things at one time. The manual is very easy to understand, I didn’t need to use it much. I just needed it for about the first 20 minutes after opening the box so I could get it up and running and a basic understanding of it. But all of the basic functions of the Traveler are easy to use and to understand. For the price, you really can expect to get much more. Its portable, well built and works like a charm. You could just have this and probably keep it as your main interface no matter where you are and you would be satisfied. Sound quality is top notch, and so is Motu’s customer service just in case you need to speak with a representative.